Star light, star bright, we got our wish tonight. Up above the world so high, we saw so many diamonds in the sky. With the "stars" aligned - good weather, a great location, and a weekend night with no prior commitments - we had a family reading experience we will never forget. 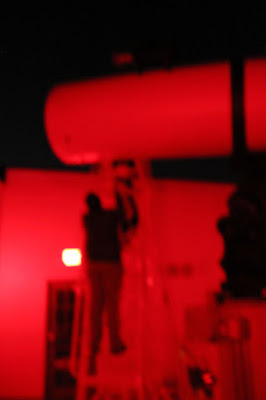 It was the night we saw more stars than we could count, the night where we stayed up way passed our bedtime, and the night where the line for the telescope tested our patience but was definitely worth the wait. 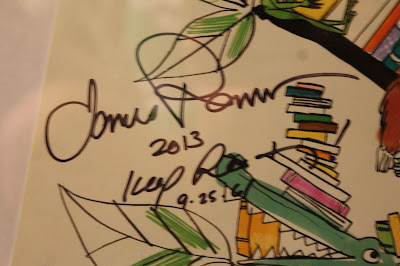 James E. Ransome is the illustrator of over 50 books including Major Taylor, Champion Cyclist by Lesa Cline-Ransome, This is the Rope: A Story from the Great Migration by Jacqueline Woodson, and Aunt Flossie's Hats (and Crab Cakes Later) by Elizabeth Fitzgerald Howard. 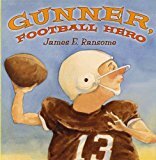 Additionally he wrote and illustrated three books of his own; My Teacher, New Red Bike!, and Gunner, Football Hero. As a child, James loved to create his own stories and drawings inspired by the Bible, comic books, and Mad Magazine. James recalled his earliest memory of this in an interview with NCCIL, "My grandmother, who raised me, began asking me to read the Bible to her. And as I read, the illustrations - filled with figures in dramatic poses wearing flowing garments and surrounded by beautiful landscapes or elaborately detailed architecture - sparked my imagination. These images were the first types I tried to imitate." In high school, James was passionate about photography and film, however one of his teachers urged him to take a drawing and painting class. This "rekindled" his childhood love of drawing. He decided to attend Pratt Institute to study illustration. At Pratt, James had the opportunity to meet Jerry Pinkney who became a mentor and had a positive influence on his art. "I had always been given the impression that there were virtually no African-American artists, so meeting, Jerry Pinkney and discovering his large body of work was very encouraging." (James E. Ransome website). It was a book by Jerry Pinkney that made a huge impression too. "I was in college when my girlfriend, now wife Lesa, gave me a copy of The Patchwork Quilt written by Valerie Flournoy, a book illustrated by Jerry Pinkney. That first opened me up to the idea to illustrating children's books. I was in the last semester of my senior year. At that time I was doing mostly sports images with the hopes of illustrating for Sports Illustrated. At that point I began making images that included children and received my first book contract within two years of graduating." (Don Tate). James' first book contract was for Do Like Kyla by Angela Johnson. James said, "I sent a mailer of my work to a publisher, who invited me to come in and show my portfolio. He offered my first book contract." (Seven Impossible Things). James went on to receive a Coretta Scott King Honor Award for Illustration in 1994 for Uncle Jed's Barbershop written by Margaree King Mitchell and a Coretta Scott King Award for Illustration in 1995 for The Creation, written by James Weldon Johnson. The book that inspired our family reading experience was How Many Stars in the Sky?, written by Lenny Hort. 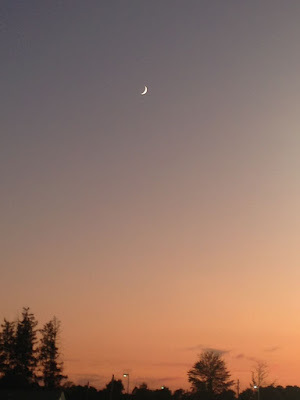 A boy unable to sleep with his mother away for the night wonders from his bedroom window, "How many stars in the sky?" His father suggests going for a drive to find the best place to count all the stars. The city proves to be a disappointment but a late night drive to the country ends up being totally worth it. 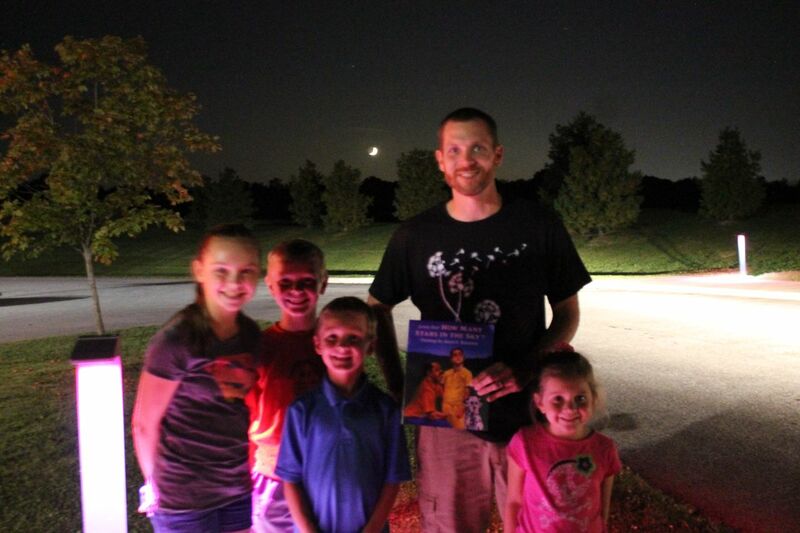 We couldn't have asked for a more perfect night for star counting. This was the view from the high school football stadium where my son was playing a flag football game during the intermission of the area high school band showcase. 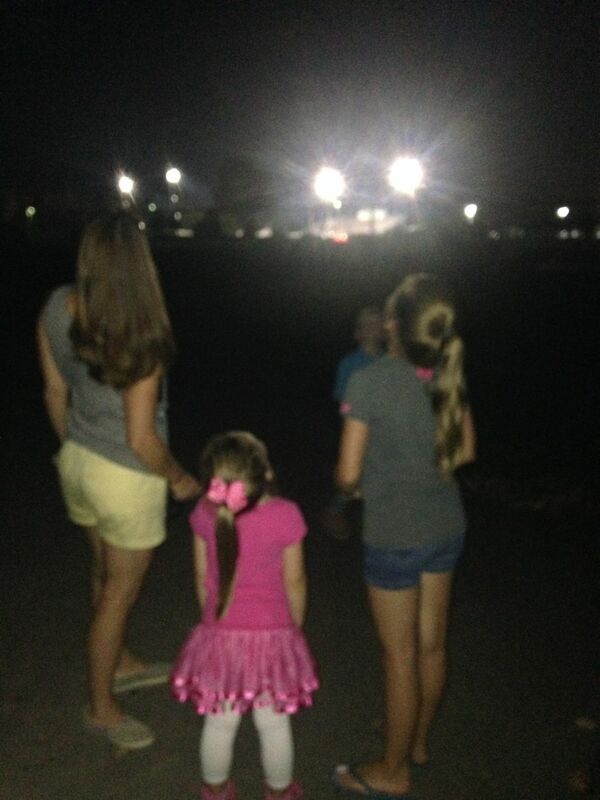 As we walked back to the car after the game, I asked, "How many stars in the sky?" The bright lights from the stadium surprisingly didn't prevent us from seeing stars. My girls said they counted about twenty-five. We left the stadium and went for a drive to the country. We were headed to a place where the counting would be easy. I read the book in the van on the way there. "We drove back through the tunnel. I was tired, and I thought we were going home. 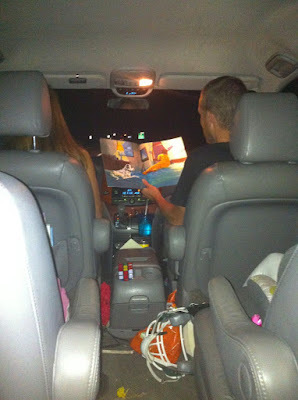 But instead, Daddy drove us deep into the country. There weren't any cars. There weren't any streetlights. There weren't any houses." -from How Many Stars in the Sky? 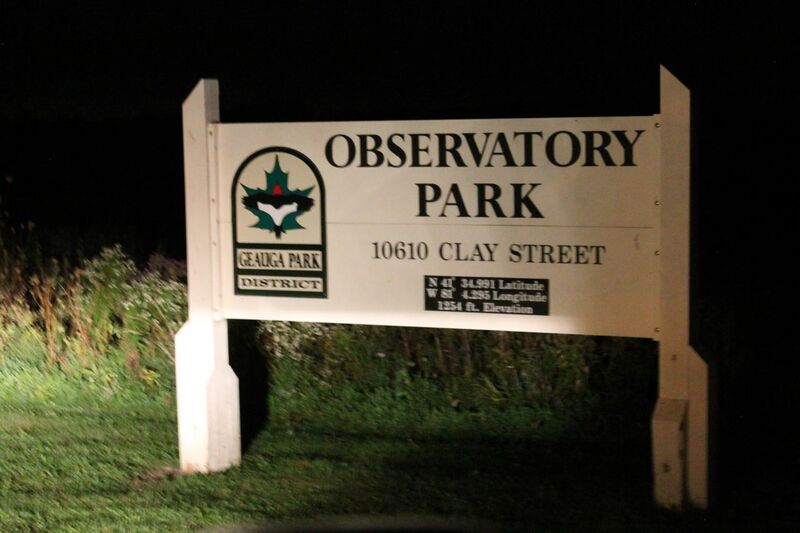 After a 45 minute drive we came to our destination, Observatory Park in Montville, Ohio. 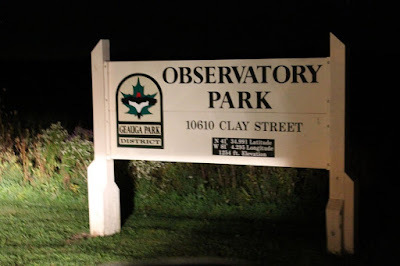 The Geauga Park District website describes the 1,100 acre park as "an area that had long been recognized by astronomers as one of the few regions left in Northeast Ohio that had not yet been affected by light pollution." The moon was setting when we arrived and the stars were "thick" just like the boy described them in the book. My oldest daughter had just visited a planetarium for a school field trip and she was an expert at pointing out the constellations. I was happy to capture this photo of the Big Dipper of the Ursa Major constellation. They loved using the Skyview app on the iPhone to help them learn new constellations. The Skyview app overlays the constellation you should see as the phone is pointed at the sky. 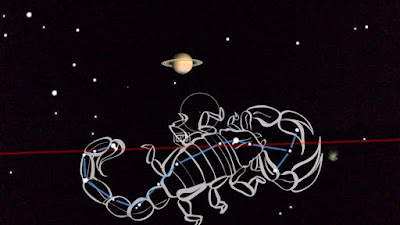 Here it shows that Saturn was out there too. At this point we didn't know we would get a chance to see it! At Observatory Park is the Oberle Observatory. 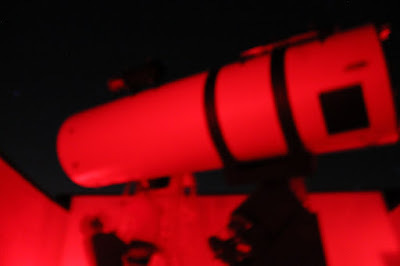 The park service had the observatory's retractable roof open and the 25.5 inch Newtonian telescope pointed and focused on Saturn for visitors to enjoy. And there were so many visitors. We weren't the only ones enjoying the beautiful night. I listened to conversations nearby as I stood in line. I learned there are many people who know an awful lot about stars, and I know very little. I said, "We are in the Milky Way galaxy, right?" My son oldest said, "Duh, Dad. I knew that in Kindergarten." In case you know very little about stars like me, I looked it up...Earth is in the Milky Way Galaxy. It is in smaller spiral arm called Orion Spur which is between two of its bigger spiral arms. It is 25,000 light years out from the center of the galaxy. (Universe Today). 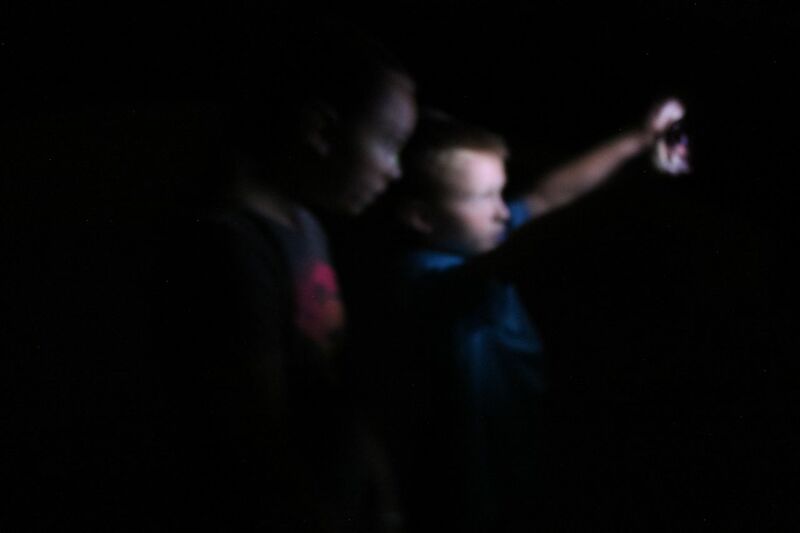 We walked up the ladder, peered through the lens, and observed the rings of Saturn. It was so cool! The park has an even larger telescope (36 inch reflector) available to the public at the Nassau Astronomical Station. Unfortunately, it was offline. 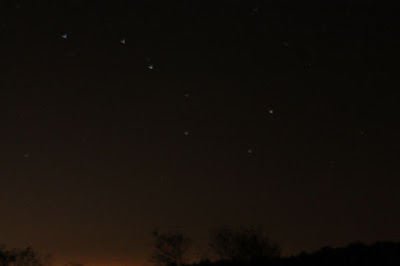 I asked my youngest daughter, "How many stars did you see in the sky?" She shrugged. I responded, "Did you see more at the football stadium or here at the park." "Here at the park," she said. "How many more?" I said. "A lot more. Hundreds more. Millions more!" she described. At the end of How Many Stars in the Sky? the boy asked his dad, "Can we try to count them again sometime?" If any of my kids were to ask me this I would have the same response as the boy's dad, "Any night you feel like it. You and me and Mama can all go out together." James, thank you for sharing your birthday with us at the National Book Festival in 2013. We hope you have a wonderful birthday. Sorry it took us so long to celebrate!